A mother, whose son is believed to have died after trying to light a cigarette in his bedroom, has said she wished she had never started smoking. 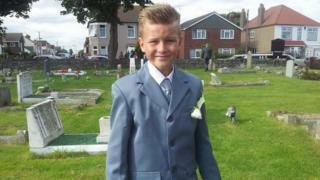 Taylor Search, 10, died three days after a blaze at his home in Pitsea, Basildon, Essex, on 1 May. His brother Liam, 13, was critically injured too. Their mother Helen Search said she always hid her cigarettes and lighters from her four children. "If I could turn back the clock and not be a smoker, I wouldn't be," she said. "Lighters, matches and that - keep them out of the way where they can't get to them," she continued. Ms Search said she was in her lounge when she first noticed something was alight. The fire alarm sounded and by the time she got near her sons' bedrooms there was thick black smoke everywhere. A neighbour who heard her screams tried to rescue Liam and Taylor but was unable to battle their way through the smoke. "I didn't realise how bad it was until I got round to the front," Ms Search said. "I saw all the smoke and the fire engines and I couldn't do anything. "I was in shock and screaming." The boys were taken to separate hospitals before being transferred to Great Ormond Street Hospital in London so their mother could be with them both. Doctors then told her Taylor had inhaled too much smoke and was unlikely to recover. He was pronounced dead three days later. Ms Search said she was told by the authorities that the blaze was caused by a "naked flame", either from Taylor's cigarette or possibly from a lighter. "We are a tight family - if I didn't have my family I wouldn't be able to cope," she added.